Romantic and mysterious are words that are often used to describe Venice. However it can be rather overpowering with queues and large numbers of cruise visitors. But look deeper and you will quickly discover a Venice that is full of surprises and delights, an enchanting city with a myriad of islands in the lagoon just waiting to be explored. Just embrace the city for what it is and you will not be disappointed. 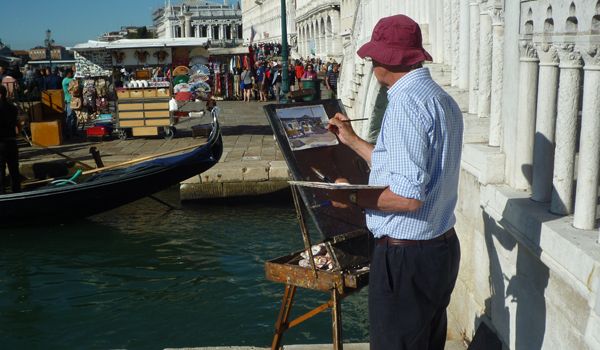 A photographer’s dream, an early walk around St Mark’s Square or along the Grand Canal will reveal a different side to the city with deserted squares and early morning commuters on their way to work. A city full of churches, art and history, there are still places where you can escape the crowds and get a taste of true Venetian life. A good travel book such as the recently published “Berlitz Pocket Guide to Venice” will quickly direct you to the main sights in the city but to see Venice properly you need to wear a good pair of walking shoes and buy yourself a vaporetto pass for the vaporetti (water buses). This is a public ferry service and the pass will give you unlimited travel for a fixed period of time. These will not only take you around the city along the many waterways but you can also go out into the lagoon. You will need a good map but don’t be surprised if you get lost! There are many bridges to cross and squares to explore but if you do get lost just ask one of the local shopkeepers for directions. 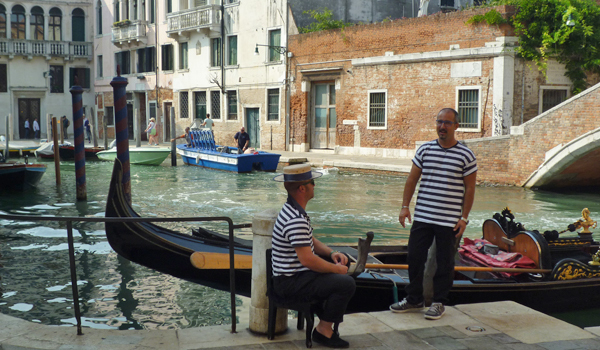 However getting lost in Venice can often be to your advantage as you are likely to discover something completely different such as a mask maker at work or two gondoliers just passing the time of day. If you are looking for somewhere different, a good place to visit is near the main railway station. 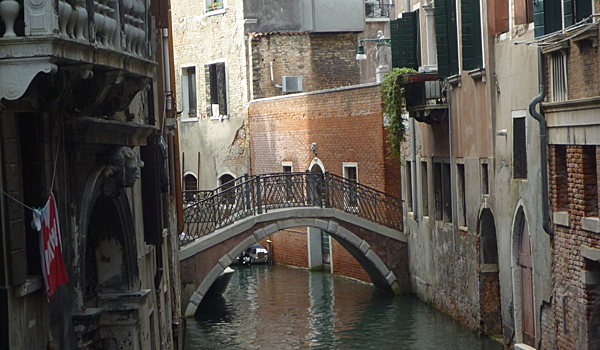 The two areas, Santa Croce and Cannaregio are both fascinating and are full of typical local shops, bars and cafes. Using your water bus pass a trip down the Grand Canal is a must but try to travel early or late in the day as the vaporetti soon get very busy. Another tip is to take the water bus service which goes around the outside of the city which can be a lot quicker and less busy. A good waterbus map is vital. If you are desperate to go on a gondola then there is a fixed rate of 80 euros during the day time and 100 euros at night. For this you can have six people, so get together with some friends and cut your costs. 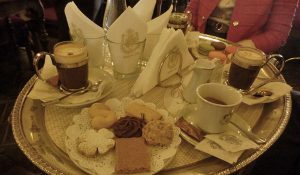 One place which just has to be visited is the Caffé Florian. This unique coffee house is located in St Mark’s Square and is one of the most famous in the world. It has an amazing history and was the only coffee house in Venice which at one time allowed women, hence its association with Casanova. Venice had an important part to play in the history of coffee drinking around the world and so a visit here is a must. It is not cheap but it is an experience that you must not miss. The rooms inside are beautifully decorated and it is a wonderful place to sit and indulge yourself. Another Venetian treasure is the Opera House known as the Teatro La Fenice. Audio guided tours are available but if possible try to have a personal guided tour taken by Luciano Arici. He has worked at the Opera House for many years and is passionate about opera and ballet. The building suffered from a major fire in 1996 but has been completely restored. Also area worth exploring is the Arsenale which is a short walk from St Mark’s Square past the water bus stops and the Bridge of Sighs. At one time this was one of the most important ship building sites in the world and was used by Dante as inspiration for the Inferno. It is a very popular area for the locals and an ideal place to see a different view of the city. Using your passes you should explore the lagoon. A short ride from the main area is the Lido. Here you will suddenly come across cars, buses, art deco buildings and long sandy beaches. With more of a feel of Hollywood than Italy, it is a great place to escape from the crowds. From the water bus terminal, walk along the wide, main street and you will eventually come to a long expansive beach with its own distinctive cafes. Prices for food and drink on the Lido are generally cheaper than in the city and it does have a very different feel to it. Further out on the lagoon is the island of Murano, famous for glass making. Whilst this is very interesting it is also the island where you can see a set of dragon bones (!) which are concealed behind the altar of the church of Santi Maria e Donato. The church also has an amazing 12th century mosaic floor. Totally free, this is a hidden treasure which requires no queuing. 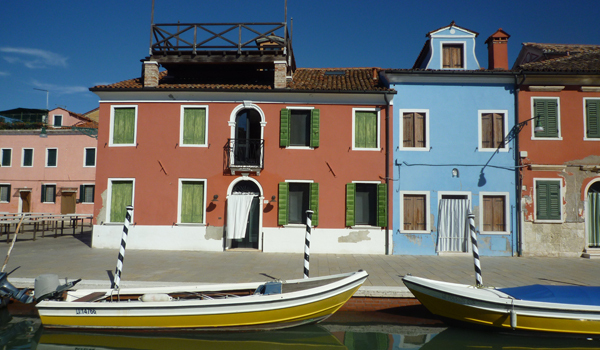 Another island which should not be missed is Burano with its brightly coloured fishermen’s houses. It is best visited early in the morning or in the late afternoon when the crowds have gone. 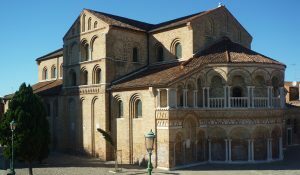 If you have time you should also go to the island of Torcello which once had a population of 20,000 and now has just 11 people living on it. Venice is an amazing place to visit and you should allow at least 4 days to see the city and the islands. Further information an be obtained from the Italian National Tourist Board. 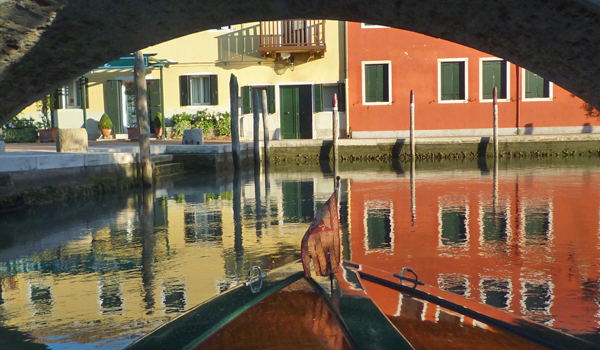 An ideal local guide to the city is Martino Rizzi who lives on Torcello and is passionate about the area. There are many excellent hotels in Venice, some tucked away on the narrow canals which crisscross the city and several on the front facing the lagoon. One of the best located must be the Locanda Vivaldi. Almost opposite the main water bus stations, the front rooms have some of the best views facing the lagoon. Out the window you will experience this vibrant city in all its different phases from the amazing sunrises and sunsets to the arrival of huge cruise ships in the early morning. Other hotels along the front include the famous Hotel Danieli with its Gothic foyer. For those wanting to try somewhere completely different then there are plenty of smaller hotels and guest houses on the many islands in the lagoon. A very different hotel is the Locanda Cipriani on peaceful island of Torcello. This was extremely popular with Ernest Hemingway. Venetians are passionate about their city so do not hesitate to ask the staff in your hotel for information on the best places to eat and some of the more out of the way sights. Walking around Venice you will come across numerous establishments serving pizzas. However search around and you should find some real local dishes. One of these is sardines and onions served with polenta. 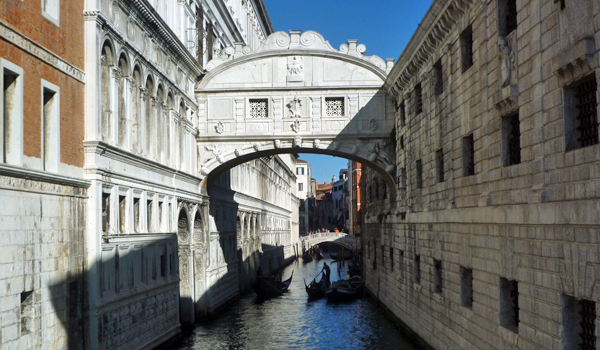 Whilst not to everyone’s taste, it is very Venetian. Another local favourite is calves liver again served with onions. If these dishes are not for you then you could stick to a pizza or for a change a calzone where the filling is inside rather than on the outside as it is in a pizza. Italian meals are divided into several courses but don’t worry as you can order just what you want. The area around the railway station is very good for reasonably priced food so why not try Osteria da Baba in Dorsoduro close to the San Panatalon Church. They serve excellent pizzas and a range of other dishes. You should also try an Aperol Spritz which comprises of bitters with prosecco wine and maybe soda. 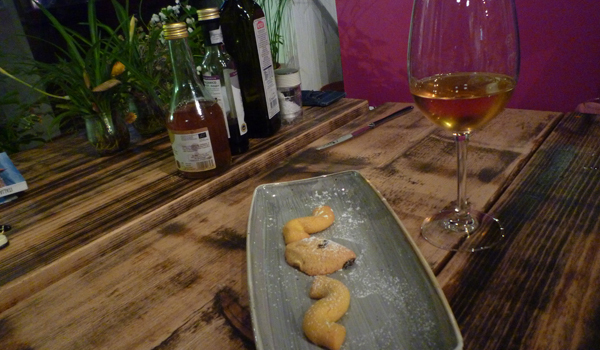 A popular dessert is biscotti (biscuits) dipped in a sweet Italian wine. If you are on the Lido the locals like to go to the Ristorante Pizzeria Stella SAS (telephone 041 2761022) just by the water bus terminal. Coffee is a must for Venetians and Italian cappuccinos are great, small but with a real kick, much better in my opinion than the very strong espresso. Breakfasts are usually quite simple. If you are staying in a hotel, expect juice, fruit, rolls, cheese, ham and cakes. Some of the Venetian desserts are very delicious as are their cakes and pastries. Talk to any young city dweller and they will tell you that Venice lacks a real nightlife and if you are looking for nightclubs then this is not the place. However there are some excellent bars along the narrow streets and plenty of cafes and restaurants. The Devil’s Forest Pub (telephone 041 5200623) near the Rialto Bridge is ideal for the young at heart. Being in Venice is all about soaking up the atmosphere so dig deep and take a night time gondola ride which is set at 100 euros or perhaps just sit and watch the sunset over the iconic buildings. If you are interested in ballet, opera or classical music there are excellent programmes of events. It must be remembered that Venice is a water based city and so there are no cars or buses. You either have to walk or use the water buses known locally as vaporetti. There are also water taxis but these can be expensive. The cost of a single ticket for visitors on the water buses is around 7.5 euros and lasts 75 minutes. However you can get some very good passes which will allow you to travel not only in the city but also around the lagoon. You will also need a free vaporetti network map. There are plenty of different services but remember going out to the furthest islands may take over 45 minutes. Venice Airport is some way from the city. One very different way of arriving or leaving Venice is by the Venice Simplon-Orient Express which provides a luxury means of transport. This can be picked up in London or Paris and you sleep overnight on the train as it passes through France, Switzerland and Austria. With restored carriages from the 1920s and Michelin star food, this is not a cheap form of travel but it is unique and is a once in a lifetime experience. 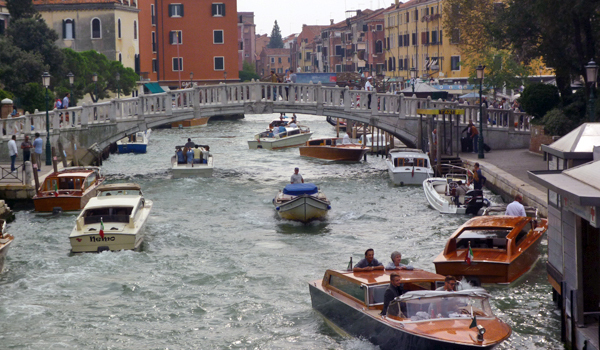 How To Get There: Venice Marco Polo Airport (VCE) is located north of Venice. Getting into the city relatively easy, as noted by the author. The easiest way, and certainly the most idealic way, is with the Alilaguna public water ferries, and it costs €15 each way, and stops at several main areas in the city center. It takes anywhere from 45 minutes to almost one and a half hours depending on your stop. A faster and cheaper option is either the ACTV line 5 for €1.50 or ATVO Air Terminal line for €8. Information regarding area transportation is available here. Best Time To Visit: The most popular time to visit Venice is April, May, June, September and October, which means airfares and accommodations will be at their peak, and lines to visit museums and attractions will be long. But the weather is warm and beautiful during this time. Tourists still pack the city in late summer, but the weather can get oppresively hot and the canals don’t smell too pleasant during this time. Fall is also a good time to visit with the cooler weather and fewer tourists, but it is also more likely to flood (Venice floods about 60 times a year), which could disrupt your trip. Winter time is when you can get good bargains and not encounter as many tourists, but Venice’s location in the north on the Adriatic Sea means that winter can be harsh with teeth chattering winds blowing through the alleyways. But winter is when the Carnival of Venice takes place, usually between last February and early March.